The professional-standard 18-hole Superior Golf Course is, by right, considered the best in Ukraine. A unique landscape, high level of difficulty, perfect turf quality and special atmosphere – we have everything that both professional golfers and beginners could dream of. From the tee of the first hole right through to the 18th green, the Superior Course is a thrilling journey. One of the course’s highlights is the 2nd hole. This hole is an island, surrounded by water with a small green and bunker on the right. Professionals appreciate the special challenge involved in completing this hole, and beginners admire the incredible beauty of the landscape. 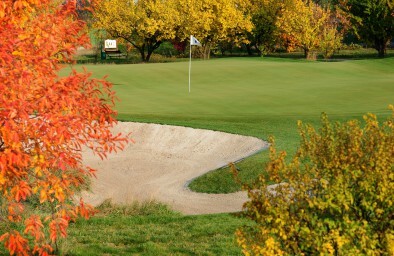 The course was opened in 2007 with nine holes (par 35). Construction of this first “9-holes” was managed by American shaper Brian Smith and Russian Alexander Stepanov. The construction of the other nine holes, designed by Australian course superintendent Andrew Glen, was completed in 2012. The result was a golf course built in the classic Scottish tradition, yet with its own charisma and peculiarities that make for an unpredictable and exciting game. The local changeable weather adds to the intrigue; a challenge that seasoned golfers relish and beginner players learn to overcome. The average green speed during the season is 8-9 feet, and tournament speed 10-12 feet (depending upon the class and category of tournament). The Superior Golf Course is certified and calibrated to EGA (European Golf Association) and USGA (United States Golf Association) standards, allowing any professional tournament to be played here. In 2013, the Superior Golf Club hosted the first Kharkov Superior Cup international professional tournament, a stage of the European Challenge Tour. The Golf Club has also been hosting the professional Kharkov Open tournament every year since 2008. The slope value of the course is 153 out of a maximum 155 (based on EGA rating).